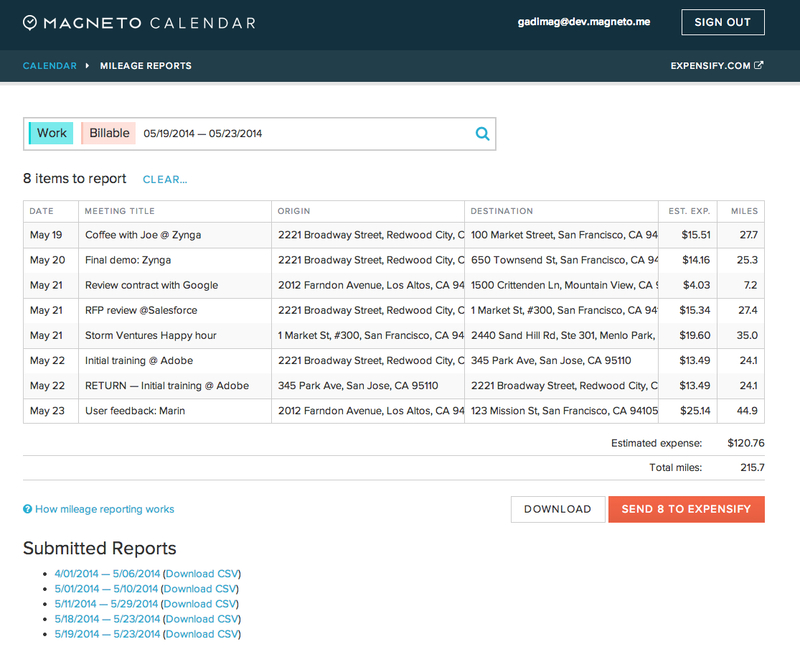 ScanAnywhere API Mileage Upgrade & Integration with Magneto Calendar! When we launched the ScanAnywhere API in early 2012, the API and really, Expensify itself, focused on scanning receipts. Soon after, we added mileage tracking capabilities to Expensify and now about 40% of our report submitters are submitting mileage expenses. At the request of many of our partners, we’ve updated the API to allow apps to pass mileage expenses into Expensify. Previously, the API only allowed importing an expense and receipt image into a user’s account. Now, with the mileage update, other apps are able to designate an expense as a mileage (or kilometer) expense and allow Expensify to either calculate the reimbursement amount based on the user’s pre-defined mileage rate or at a rate specified by the partner’s app. We are also adding the ability to pass along a map image to go with the distance traveled. We’re also excited to announce our newest integration partner and the first company to make use of the new API upgrade: Magneto Calendar! Magneto is a cloud-based system that syncs and fixes your various calendars. Better yet, it calculates and adds drive times between your various meetings, adjusting for traffic. Magneto calculates the distance between your meetings and uses the ScanAnywhere API to pass that mileage into your Expensify account. Now, Magneto users will have all their business travel automatically entered into their Expensify accounts for reimbursement or tax purposes. Send your mileage expenses from Magneto to Expensify! Just one more way you can automate the busy work out of your life. If you know anything about us here at Expensify it’s that we love automation. We’re also excited to welcome Magneto into the Expensify ScanAnywhere Alliance and we look forward to seeing all the great ways our partners will utilize this new API functionality in the future.